Want to make sure Bed Bug treatment has worked? A Bed Bug infestation is a distressing experience - not one you would wish to repeat. Therefore it is important to validate the success of your treatment with the use of a Bed Bug monitor. Unfortunately, the success rate of expensive, professional pest control remedial treatments to eliminate Bed Bugs is not 100%. Even if complete elimination has been achieved, the potential for re-infestation remains. 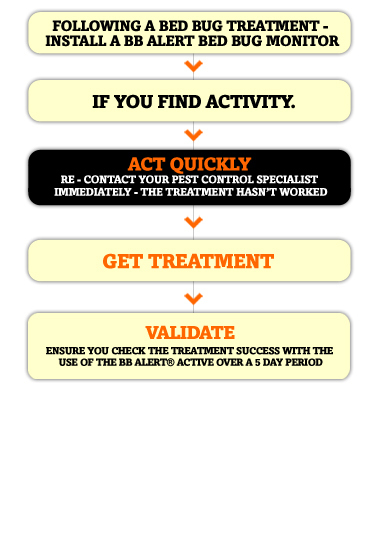 BB ALERT® proactive monitoring provides ongoing reassurance that your home remains Bed Bug free. The BB ALERT® monitors provide a cost-effective solution to the problem of early detection of Bed Bugs. They are discreet, simple to use, pesticide free, and safe for everyone around your home. The BB ALERT® ACTIVE monitor attracts Bed Bugs looking for a blood meal. You should monitor for two nights over a two to four day period. If you have an infestation you will find bugs captured within the monitor varying in size from 1.5mm - 5.5mm.